Julian Comstock: A Story of the 22nd-Century America originates from the novella Julian: A Christmas Story, which has been expanded into a rich personal life of a man who is something of a folk hero to some and a villain to others. The world of the 22nd century is still in the process of rebuilding itself after the collapse of technology and the rise of oceans with a decimated population amid the end of oil. The United States still exists although in different form. The 22nd century is now more like the 19th with a strong civil war era feel and lot of train travel. The United States, which now encompasses Canada as well, is fighting with the Mittleuropean block who are horning in on what was formerly North Eastern Canada. Julian is as upper class as you can get, but the story is told from the point of view of Julian's best-friend and beautifully named, Adam Hazzard, who is himself a very endearing if not somewhat naive chronicler. While Julian has had every comfort in life Adam comes from what is the indentured servant class that has developed, which is essentially the middle class of this era. Julian and Adam have grown up together as teenagers being tutored by the same man to give Julian a companion for his studies. The beginning of the story is set in a remote part of the Americas where Julian is being safe guarded from his Uncle the President Deklan Comstock, who is also responsible for killing Julian's father. From there we roam across the East of America, which is only a glimpse of this rich world. Big bloody battles and heartfelt dialogue carry this story a long way. Julian Comstock is romantic and unflinchingly honest. With Julian Comstock the titular character Wilson has crafted his own Che Guevara, Ben Franklin, and Casey Jones all rolled into one. Even with the telling Julian is still something of a mystery, but his exploits are inventive and awe-inspiring as he holds true to his belief despite what might befall him. As Adam and Julian try to slip away from the noose that Deklan lays for them they unwittingly fall into the very trap as they are conscripted into the Army and taken to the front-lines and so the legend of Julian Comstock aka Julian Conquerer begins. Deklan Comstock the despot of a president remains a cloudy figure even when he takes center stage. A bit of missed opportunity was lost in not having a major interaction happened between Deklan and his wayward nephew Julian. 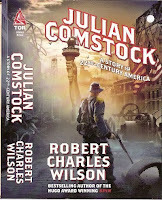 With Julian Comstock Wilson has brought back a sense of frontier adventure to Science Fiction with some of the most well thought out characters I've encountered in ages. No matter how large the scale is the story keeps its personal roots. Suffice it to say I could not get enough of this world. Julian Comstock is without a doubt the best novel Robert Charles Wilson has written to date and one of my favorites reads this year, which says a lot in my mind given how much I enjoyed his Spin. I give Julian Comstock 9 out of 10 Hats. If you're a fan of life histories this is sure not to disappoint. The mass market version will be released in May. Wilson is currently at work on the 3rd volume of his Spin Cycle trilogy titled Vortex. I keep hearing about this and it's slowly becoming the book I have to have. Thanks for the review. This one's been sitting on my shelf for a while. I've got to get to it soon. @Seak - It is definitely worthy of all the praise it has gotten. @Ben - I put it on my Christmas wishlist and I am very happy I did. Make the time to get to it.